Last year it was head-to-head: Levon Aronian vs. Vladimir Kramnik. It ended in a draw. 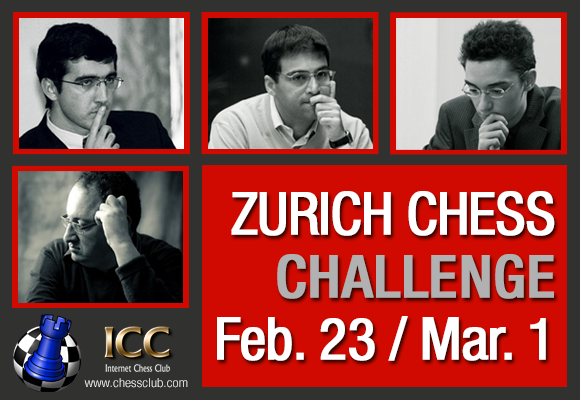 This year in Zurich the "challenge" will be a quadrangular, with four among the strongest players of the moment. World Champion Vishy Anand, Former WC Vladimir Kramnik, Fabiano Caruana and Boris Gelfand make this event one of the most interesting in this still young 2013. Anand and Caruana will cross again their Kings over the board, after only a few days since the interesting Grenke Chess Classic, played in Baden-Baden, Germany. Anand won that event in a sort of daring way, after Fabiano had led the pack for 8 rounds. Caruana faltered in the last two games, allowing the World Champion to clinch his first victory in a classic event. Anand will also meet again his challenger for the last World Championship match, Israeli GM Boris Gelfand, who is never an easy guest. So, there are several themes that makes this event a very interesting one. Play starts February the 23rd at 9:00am EST (ICC time). Caruana wins the tournament, a point ahead of World Champion Anand. Congratulations to the strong American/Italian talent!